“To nourish someone is to feed them deeply something that’s very good for them”, Alice Waters. The beautiful hot weather is back and at times it can get a bit much; you do not even have to lift your finger and your sweating bucket loads! Therefore, it is imperative to stay hydrated and keep your electrolytes in balance. I have been playing around with different smoothie mixtures and right now my favourite involves banana, coconut milk, superfood shake mix by Soaring Superfoods and bee pollen. It is so creamy and delicious and creates a great chill vibe in the sunshine or after a pumping workout. Superfood shake mix contains lucuma powder, mesquite powder, raw cacao powder, hemp seeds, maca powder, cinnamon, vanilla powder and sea salt. I highly recommend it; you can even add it to a banana soft serve. Lately, I am a big fan of bee pollen. They are little individual grains or pellets that vary in colour as you can see from the image. You can taste honey off the bee pollen. If you have pollen allergies probably best to omit. I recently discovered “Koko”, coconut milk in Dischem (South Africa) but you can also find it in Super Valu (Ireland). It tastes great in smoothies, shakes, soaked chia pots or oats. I used a frozen banana for the smoothie. I usually have a couple in zip lock bags in the freezer; they create an ice cream texture in a smoothie and you don’t have to add ice either. This recipe is gluten-free, dairy free if you use coconut milk and sweetened with fruit. Enjoy! 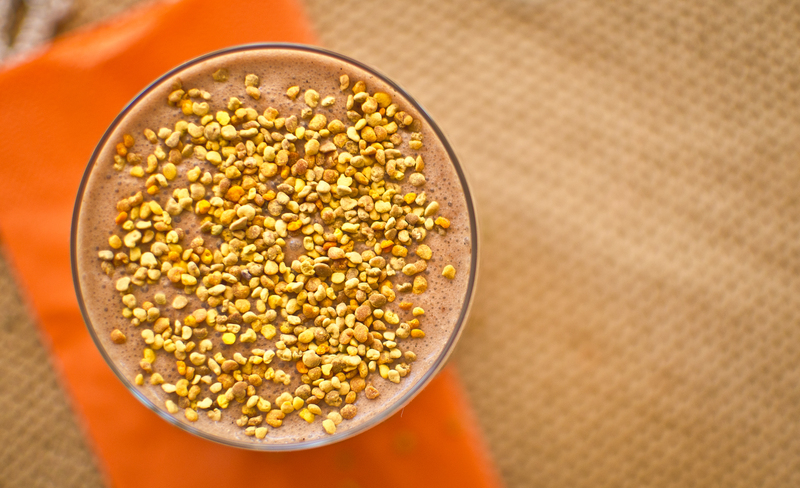 Pop all ingredients in a blender except bee pollen – blitz until well combined. Pour into a tumbler and sprinkle bee pollen on top.